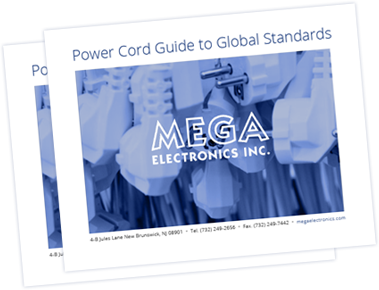 Card edge power connectors | MEGA ELECTRONICS, INC. Looking to the growing use of electronic boards in modern appliances and considering the increasing interest for card edge connections not only for signal but also for power, I am pleased to inform you that MEGA Electronics Inc has developed a new range of card edge power connectors. 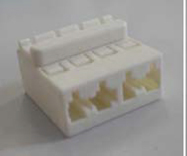 These connectors over mold a 4 space receptacle with 5mm pitch distance between the spaces and using fork type for PCB Edge mating terminals, in conformity to Molex 94529 or Mikroplax WB5004H. If requested the PC440 family also provide the possibility to have a ground wire that comes out from the body of the connector (pls see the red circle in the below picture), that could be customized in length and termination. The PC440 family accept Up To 5 conductors cable, 4 conductors in the edge connector and 1 as external ground. The terminals accept conductors size between mm 0,5 to 1,00 or AWG 18-20. PC 440 is molded with PVC as per standard plugs and can be fitted on cables of Maximum OD of 8mmsq. either in PVC or Rubber. This product is also available in a LSZH (low smoke zero halogen) version for Environmental friendly applications. The PC440 connector is available in combination with a range of international plugs to create a variety of international extension cords, or could be supplied with a cable that can be finished based on customer preference as in a usual power cord. This solution provides to the customer a strong and reliable electrical connection of the cable to the electronic board, with very fast connection time, and consequent reduction of the labor cost for the product assembly. The over molding provides protection to dust and water and robustness on the crimping and contact insertion. In the attached drawing you can see the dimension of the PC440 and the receptacle. For any further information you may need you can feel free to get in touch with me. Gulf States G Mark and Singapore Spring Safety mark are now mandatory for power cords. Section 301 List 3 – Effective September 24, 2018, additional 10% tariff on power cords and power supplies.